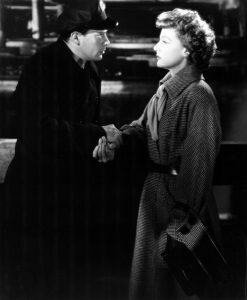 Kennington Noir Presents Woman on the Run (1950), directed by Norman Foster, and starring Ann Sheridan, Dennis O’Keefe and Robert Keith. Anne Sheridan gives a memorable portrayal of the wife of a man who has gone into hiding having witnessed a murder. Unfortunately, the murderer tried to bump off Anne’s husband too, so Anne is desperate to find her husband first, before the police and the bad guys, and she teams with a press reporter who claims he wants the scoop on the story and is willing to pay to help out. 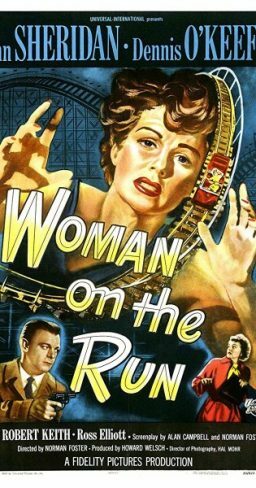 Chock full of snappy 1940s dialogue, and shot on location in San Francisco, Woman on the Run is a treat for noir fans. The exciting night-time climax, set at SF’s “Playland on the Beach” amusement park, predates by a year the similar use of a fairground at the end of Hitchcock’s classic Strangers on a Train (1951). Mr. Ken Noir is pleased to be able to screen this instalment from a rare original 35mm print.